To date, every study that identified practice-related changes in brain structure located these changes in grey matter. Now, for the first time, a paper by Scholz and colleagues in the journal Nature Neuroscience has identified training-induced changes in white-matter architecture. This has important implications for how we understand neurodevelopment. What are grey (gray) and white matter? Grey matter is a thin layer (less than half a centimeter thick) that forms the outermost part of the brain. It derives its grey color from neurons and unmyelinated (uninsulated) axons. Grey matter is considered the part of the brain that accomplishes the major cognitive chores – attention, language, learning, memory, perception, and thinking. As such, it was not surprising to discover that when we learn our grey matter changes. White matter is different. It consists mainly of myelinated axons and does not contain dendrites. It is most commonly regarded as the support structure to the cerebral cortex, and interconnects different brain regions. Hitherto, changes in white matter as a result of learning had never been observed. 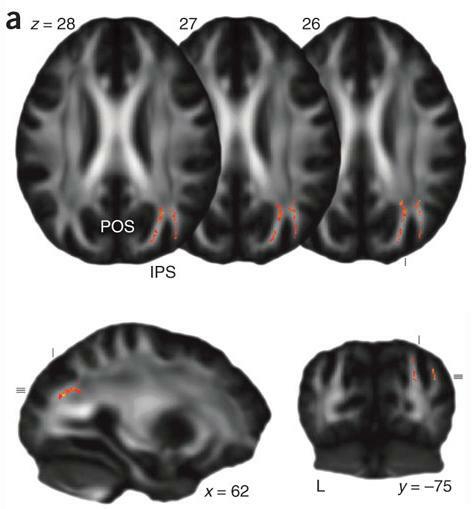 Scholz and colleagues used diffusion tensor imaging (DTI) to measure white matter in 48 individuals (DTI is a relatively new neuroimaging technique capable of penetrating deep into the brain). Half the individuals were placed into a training group for 6 weeks, where the learned to juggle. The other half did no training for the same six weeks. All the participants were scanned before and after training. Unsurprisingly, the training group showed significant differences in gray-matter density. What will come as a surprise to many is the observation of increased white matter volume in the training group, specifically the area underlying the right posterior parietal sulcus. The control group showed no such differences. In most neuroscience textbooks, white matter is given scant consideration, especially when it comes to learning. Changes in dendrites – dendritic growth – generally hog the headlines as hallmarks of neurodevelopment. When we learn, dendritic branches (little tree-like protrusions that spurt out from our neurons) form new synapses and build the connections that help us remember. White matter has no dendrites, so clearly there is something else going on. The authors suggest that electrical activity in axons (as the result of learning) may regulate myelination in axons. Similarly, gross changes in the axon – the diameter or packing density – may be the cause. Whatever, the reason, the white matter is changing. This is very important and promises to elevate the status of white matter as a correlate of neurodevelopment. Moreover, the countless MRI and fMRI studies that associate grey matter changes with everything from Internet use to the acquisition of wealth may only be telling half the story. 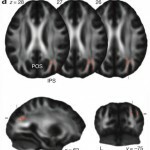 MRI techniques are not able to penetrate white matter, and is is quite conceivable that the myriad of studies that focus on the cerebral cortex are missing something. Researchers and educators take note – white matter really does matter!! Print article This entry was posted by connolly on October 19, 2009 at 6:22 pm, and is filed under G2C Online. Follow any responses to this post through RSS 2.0. You can skip to the end and leave a response. Pinging is currently not allowed.